Summer Lodging Specials and Packages at the Inn at Jackson. There is plenty to do in the White Mountains anytime of the year, but especially during Summer. Jackson, New Hampshire, a quiet resort town in the heart of the White Mountains, is the perfect spot for a Summer weekend getaway. The town is home to an admirable variety of places to stay — from quiet, romantic inns to busy, packed hotels — all of which feature classic New England charm, of course. For the outdoorsy type, hiking is the activity of choice in the summer. Don’t know what you’d like to do? Why not let us help you plan some of the fun. All package rates are based on double occupancy unless stated otherwise. Custom packages are also available so feel free to ask for one and we’ll put it together for you. 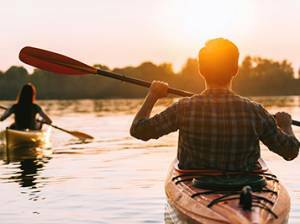 This package includes: 2 nights lodging in one of our Mountain Lodge rooms, 2-4 hour kayak trip for 2 (with Saco Canoe Rentals), 2 zipline tickets (@ Wildcat Mountain). Plus, a shared appetizer, 2 entrees, and shared desert for dinner at our own Shovel Handle Pub and our neighbors Inn at Thorn Hill or other local restaurant dependent on availability. The excitement doesn’t end there – you will have access to our outdoor heated pool and 1/2 acre trout pond, both located 2 miles away at our other property – Whitney’s Inn. Looking for the package that has everything? Experience the beauty of Jackson Village and the White Mountain National Forest. Combine it with the romance of the Inn at Jackson and your significant other will love you for this trip! Package includes: two nights lodging in one of our Victorian rooms, a bouquet of flowers, a one-hour couples massage at Moondance Massage. Plus, a shared appetizer, 2 entrees, and shared dessert for dinner at our own Shovel Handle Pub and our neighbors, Inn at Thorn Hill, and room refreshments delivered to your room. Almost everyone who comes to the White Mountains of New Hampshire has the same question. How do we see a moose? 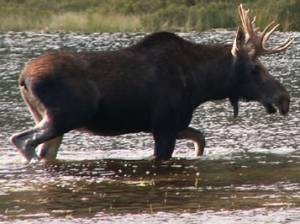 Well, what if we tell you that you have a 98% chance of seeing one in the wilderness when booking a moose tour as part of this package? Package includes: two nights lodging in a Mountain Lodge room, tickets for two to a three-hour moose tour, a shared appetizer, 2 entrees, and shared dessert for dinner at our own Shovel Handle Pub and our neighbors, Inn at Thorn Hill or other local restaurant dependent on availability.